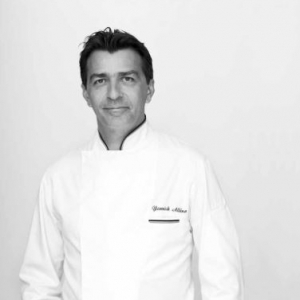 As part of a highly select circle of the world's greatest chefs, Yannick Alléno is as enthusiastic as he is inspirational in devoting his life to his passion, and militating for strong French cuisine, rich in its legacy and ambitious in its creations. Questing and demanding, he pushes the envelope and lays the groundwork for a new cuisine that affirms its unique identity: Cuisine Moderne. As sponsor, Yannick Alléno takes part in the selection committee for the prizes awarded by SIAL Innovation. He will define a "foodservice" theme trail and select products presented by the exhibitors for inclusion in a basket bearing his name. The chef will also be appearing on SIAL TV on the opening day of the exhibition, on 21 October. Why did you agree to be this year's patron of SIAL Paris 2018? As a chef, I believe it is important to be aware of changing food behaviour and the new cravings of consumers. For us, these developments are real drivers of creativity: they force us to adapt, to look beyond. An exhibition such as SIAL is a unique occasion for bringing together professionals from around the world in pursuit of this desire to assemble, create and innovate for the food of tomorrow. And this is why I am so proud to be the patron of SIAL Paris 2018. This spirit of emulation, the events, the opportunity to meet up with all these different exhibitors make it a truly unique trade fair, at once convivial and above all profoundly inspirational. For SIAL Paris, you have devised an Innovation theme trail dedicated to Foodservice. How did you go about sourcing innovative products? As well as being patron, I am also a member of the SIAL 2018 Grand Jury. Our mission is to test ahead of the exhibition more than 200 products, which have already been subject to preselection, and to designate around a dozen truly innovative ones, which might - we hope - revolutionise foodservice and which merit inclusion in the theme trail. Currently we are still in the test phase, although there have already been some great surprises: make a date for 21 - 25 October!